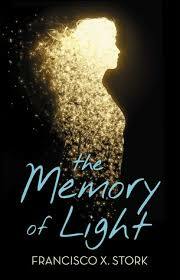 a book chick: "The Memory of Light"
my take: Thank you, Francisco X. Stork for writing this book. I cried when I read your author's note at the end. It hurts me to know you also hurt. Your book will help people. Your carefully crafted words resonate and give hope. Your characters are windows and mirrors into the minds of so many of us humans. Thank you for this coming of age tale of mental illness and holding out the light for others to remember. I won't soon forget Vicky, E.M., Mona, and Gabriel. my source: Saw this on BookRiot's Best Books of 2016, So Far list ... reminded me that I met Mr. Stork at Calvin College's Festival of Faith and Writing a few years back. He is a kind, curious man who radiates a warmth and child-like wonder. I was thrilled to say hello to him and he seemed delighted to be attending the other authors' presentations and almost surprised that he was an author among authors. my verdict. Excellent read - young adult literature can talk to you in special ways - especially because you can read them in the span of fewer hours and let the whole book - all the characters and words - pour over you. If you haven't read Marcelo In the Real World, it's definitely worth your time. ah, i loved marcelo, and will definitely be picking this one up soon. Can't wait to get to this one!